- FB852 - 22x26mm ( with 8x18mm Rebate ) x 2.4 metres Red Hardwood - Richard Burbidge. 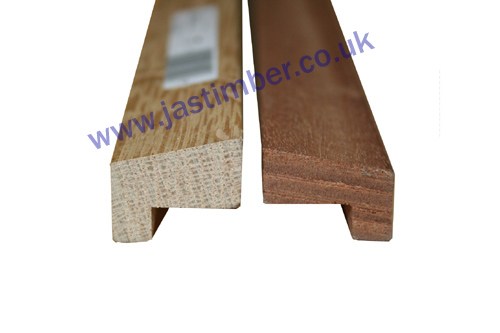 - TM889 - 21x26mm ( with 8x18mm Rebate ) x 2.4 metres Red Hardwood - Cheshire Mouldings. Hardwood Hockey Mould is ideal to use as an internal FD30 Fire-Door Glass-Bead. The hardwood is of a high enough density for this purpose for Firecheck Certi­fica­tion. The Cheshire Mouldings and Richard Burbidge Timber Grading is to have a substantially knot free timber on three sides ( of the square timber, before machining to Hockey Stick Bead. ) - The grading allows several knots per piece, but in practice there are a small number of knots, and many pieces are knot free.­ The specifi­cation for timber bead from our suppliers also allows engineered and finger-jointed timber timber to be used. 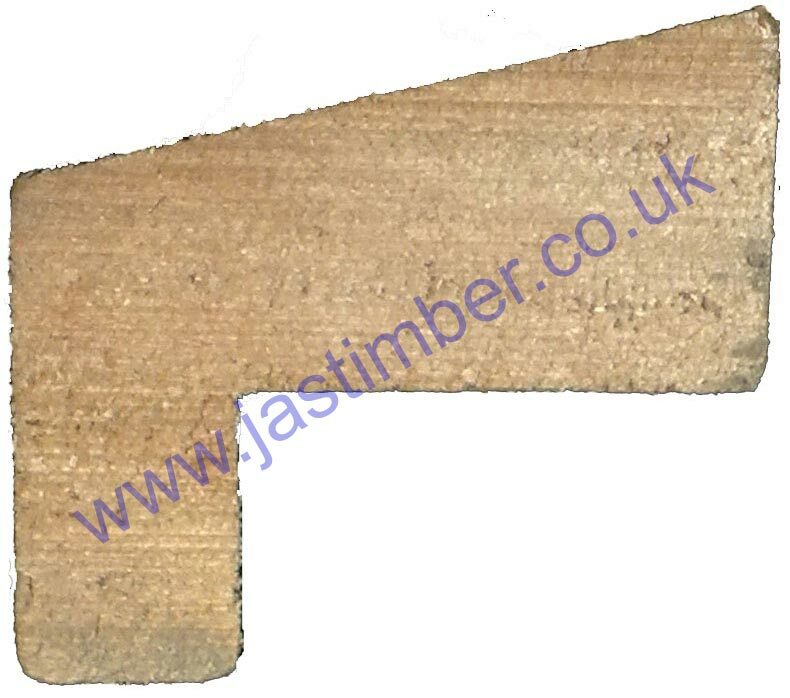 21x26mm Hockey Stick Firecheck Glazing Bead should be treated and fixed in place as soon as possible to help minimise any movement/­twisting and surface checking/­splitting that occurs naturally with changes in moisture content; Small hardwood mouldings can not be recommended for use externally; External use of 23x26mm Planed Timber Hockey Stick Firecheck Glass Bead is at your own risk - Timber life expectancy is increased with good timber treatment and protective weather-proof finishing coats. It is better to use pressure treated timbers externally. - We cannot be held responsible for any variations in machined Hardwood Hockey Fire Door Bead sizes, pattern, construction, grading, moisture-content, treatment, certi­fica­tion, knots, colour or grain. - We cannot exchange any Hardwood Hockey-Stick Bead once work has commenced. Orders of FB852 or HTM889 Hardwood Hockey Stick Glass Bead, and ALL Direct Deliveries are supplied as a Special Order. Payment - We can take Debit Card, BACS, Cash, Cheque or Credit Card payments online for FB852 and HTM889 Hardwood Mouldings. Prepared Timber 1 inch Hockey Stick FD30 Glass Bead can be purchased online - Just add to basket. E. & O.E. see T&C - We do try to keep prices and specifi­cations of Hardwood 1" Hockey Stick Glazing Bead correct, but mistakes can be made!